June 25: NC Gov. Roy Cooper signed a bill expanding opportunities for employment of individuals with criminal records (no more than 3 Class H or I felonies and any misdemeanors), by shielding employers from negligent hiring claims if they relied on the ‘certificate of relief’ given to these individuals by the state. This law is effective December 1, 2018, and applies to petitions for the certificate filed on or after that date. June 28: The U.S. Supreme Court found that states and public-sector unions may no longer have union dues deducted by non-consenting employees. Employees must choose to support the union before dues may be deducted from their pay. July 2: On this date 54 years ago, President Lyndon Johnson signed the Civil Rights Act of 1964, prohibiting discrimination in employment, education, voting, public accommodations, and also established the Equal Employment Opportunity Commission (EEOC). 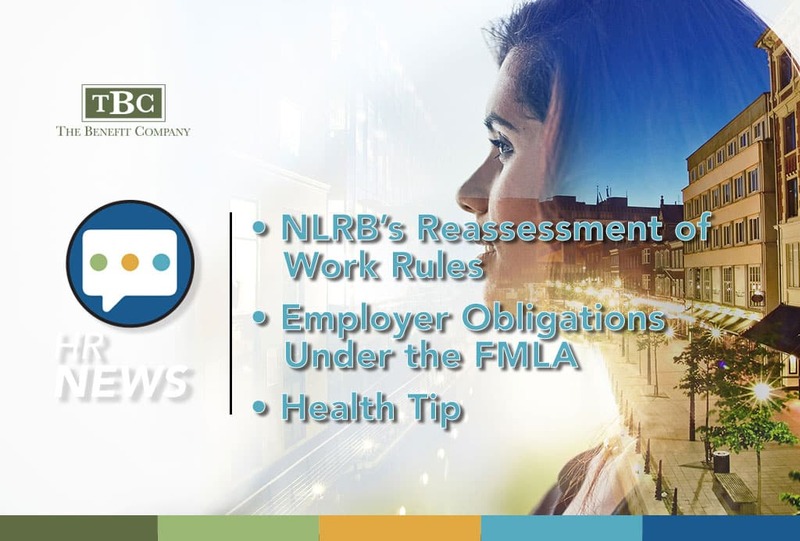 You have probably read about legal issues some employers have encountered, with company Handbook work rules that the National Labor Relations Board (NLRB) deemed to negatively impact employees’ ability to exercise their ‘Section 7’ rights. In a nutshell, Section 7 of the NLRA involves employees’ rights to unionize, and to join together to advance their interests as employees, and to refrain from such activity. Employers cannot interfere with these employee rights. Rules banning disloyalty, nepotism or self-enrichment. Disparagement or criticism of the employer (as opposed to civility rules regarding disparagement of employees). This is very helpful guidance from the NLRB, and should make employers feel more confident in retaining work rule policies probably currently held in their Handbooks. Be sure you don’t retaliate or interfere with an employee’s right to take FMLA leave. **Properly tracking FMLA leave, especially if intermittent leave is involved, can be a nightmare. Do the best you can. When in doubt, consider giving the employee the benefit of the doubt by erring in their favor. No matter what, make sure the easy items above are handled as there isn’t a good excuse not to get those right. Why? The receptionist will certainly have one for you to use, to complete the usual paperwork required to update your address and insurance, and sign the HIPPA notice. But think about who is already in the waiting room: sick people, who have just used the pen the receptionist gave to you! You have your own germs to worry about, or you probably wouldn’t be there. Consider taking and using your own pen the next time you have a doctor appointment. This newsletter is not intended to provide legal guidance to you. We welcome your input on topics you would like to learn more about. We encourage you to contact the author of this newsletter, Caryl Kuchman, SPHR, SHRM-SCP at 803.729.8398 or at ckuchman@benefitcompany.com if you have questions on any information presented.